Laffy Taffy is one of America’s most well known a candy brands loved by children and available in a variety of fruit flavors. It is a modern form of taffy or toffee and is chewable. Laffy Taffy is manufactured by Nestle. It is packed in a variety of formats depending on the needs of the market. It comes in smaller pieces of individually wrapped Laffy Taffy packed in a jar or larger 1.5 oz candy bars. Taffy or toffee is a mixture of sugar and butter boiled until it reaches a gooey consistency that can be stretched and pulled into shape. The stretching is most important as this prevents the taffy from becoming hard and more like rock candy. Laffy Taffy was first released to the market by Breaker Confections in 1883. It is believed by some historians that the basic recipe of taffy may have come from the Roman times. Certainly the vary basic form of hard toffee has been a favorite in Scotland since at least the time of Robbie Burns. Although in Scotland toffee is known as tablet which is too hard to be broken with teeth. The soft and chewy which is known today as taffy was very popular from mid to late 1800s. It was a simple candy made by local stores. 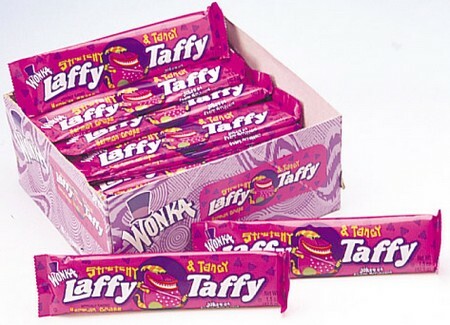 A copy of taffy only sold in North America was invented accidently and sounded like a story written by Roald Dahl just like the modern Laffy Taffy. An Atlantic City shopkeeper by the name of David Bradley was mopping up his store after a tidal wave had ruined all of his stock when a small girl came in asking for a bag of taffy. Breaker Confectioners had changed their name to Willy Wonka brands which was successful in US and popular among children. Willy Wonka was a character from a book called “Charlie and the Chocolate Factory”. Later the movie was released on novel this story in 2005. A new variant of Laffy Taffy arrived on store shelves in 2005 to complement the smaller rectangles shaped bars and the flavors included cherry, strawberry, sour apple, grape, banana and blue raspberry.